Every parent wants to make sure that their newest bundle of joy has a safe space for sleep whether it’s for naptime or bedtime. One major necessity for every nursery is making sure that your baby has the perfect crib. We came up with a list of the highest rated cribs in today’s industry. Whether you’re looking for something that can convert into a toddler bed, one that’s simple or stylish we’re sure that our list has exactly what you’re looking for. Be sure to check it out below. When it's time for your little one to lay down their head, you want them to have the best crib possible. Our new format allows you to look at numerical ratings and specific criteria for each product we evaluate! For this update we added a new crib on our top ten list. We also update our criteria section and added a bit more information. We also made sure that each product on our list were still the highest rated and are all currently available. Be sure to check our FAQ for any other questions or concerns that you may need answers too. Dream On Me designed the crib to be easily converted into a toddler’s day bed and into a full-sized kid’s bed. This simply means that you don’t have to be looking for another bed in the next 10 years or so. 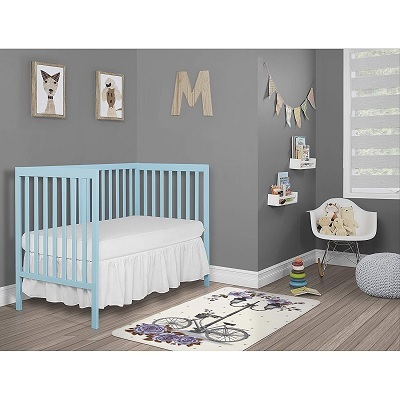 The Dream On Me Classic 3 in 1 Convertible Crib has a classic, retro design look and comes in several assorted colors to make decorating your little one’s room effortless. It converts from a crib to a toddler bed with rail support, to a daybed when they are ready for their big kid bed! It has a teething guard for the day when your little one starts to teeth, along with safety lock wheels to ensure added safety. The material is made of pinewood and it also meets CPSC and ASTM standards for extra peace of mind. 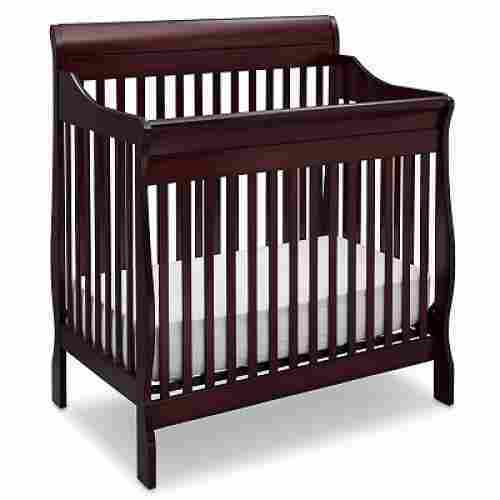 Made of high quality and truly elegant Pinewood, the Carson Classic 3-in-1 Convertible Crib features a non-collapsible or non-drop side design that allows it to be perfectly safe. The rails are duly featured with teething surfaces for older babies who are already showing signs of tooth eruption. The Carson also features safety locking wheels and a dual hood design in addition to 3-level mattress support. 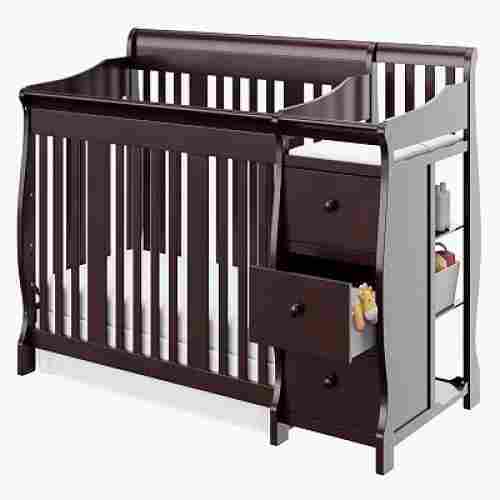 The wheels make it easy for you to move this crib from room to room or even to a different spot in the nursery. 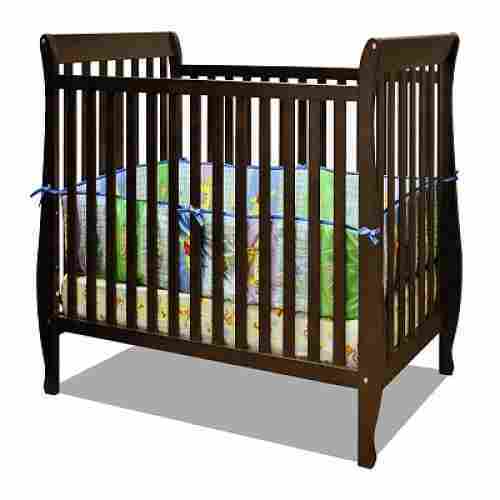 The safety locks on the wheels will keep the crib stationary as your baby wiggles around. Babyletto might well be the over-achiever of the baby supply world--but we love that about them. 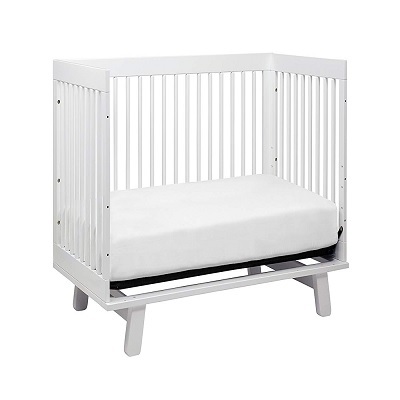 The crib has an open, modern aesthetic to it, and comes in six different color schemes: white, espresso, gray, white/gray, white/natural washed, and all-natural washed. The 3-in-1 Hudson Convertible Crib is Greenguard Gold Certified and tested for more than 360 VOCs, and more than 10,000 chemicals. When your child begins to climb or reaches 35 inches, don’t sweat it; the bed can easily be converted to a toddler bed and daybed as your child grows and their needs (and yours) change. 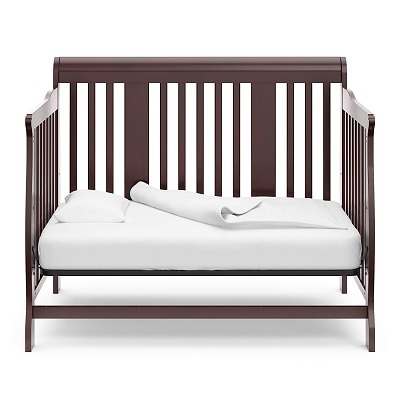 The crib has an open, modern aesthetic to it, and comes in six different color schemes: white, espresso, gray, white/gray, white/natural washed, and all-natural washed. This crib is functionally designed. The three-in-one convertible feature means that you’re not buying a piece you’ll have to replace in a few months. It even has an adjustable mattress platform, making it easier to elevate baby’s bed so moms and dads aren’t having to lean over quite so far to tuck baby in at night. This sturdy crib is meant to last. It can be converted between three modes, making it accessible and functional through several stages of early childhood, and is constructed from top-quality New Zealand pinewood. 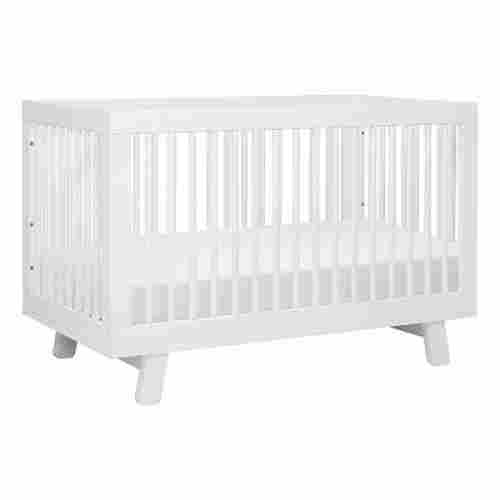 The standard requirements for cribs are slats that can bear 80 pounds in weight, a total content of less than .009 percent lead paint, and less than 1 percent in phthalates. Babyletto’s cribs are made with slats that will hold up to 135 pounds of weight, have less than .001 percent lead paint, and no detectable phthalates. 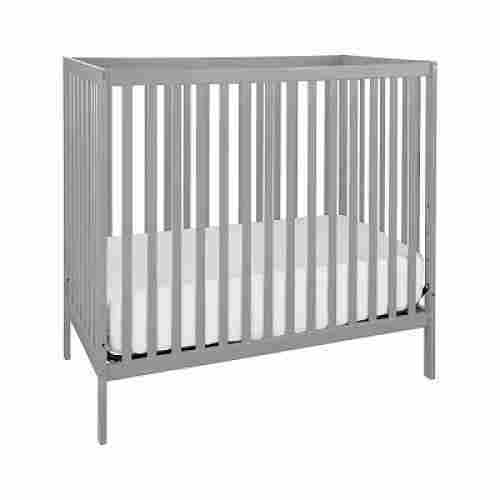 They strive to make the sturdiest and the safest cribs for your family, while still providing a variety of styles that will fit your personal taste. 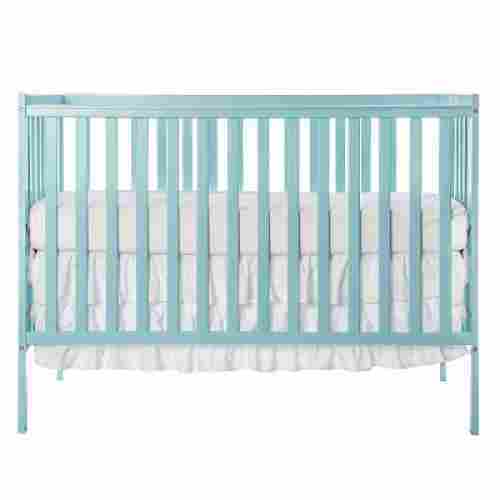 This crib is available in six colors. 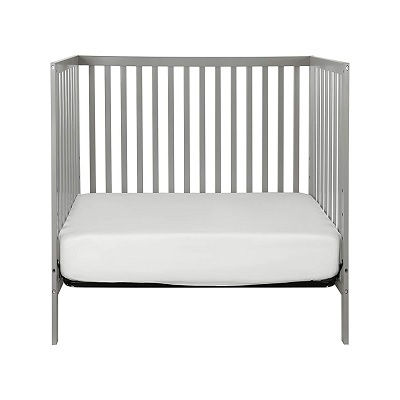 The simplistic design and clean lines of the crib make it a beautiful addition to any room in your house no matter what color you choose. With four adjustable mattress levels, you can guarantee your baby’s safety by lowering the mattress as they gain more mobility. 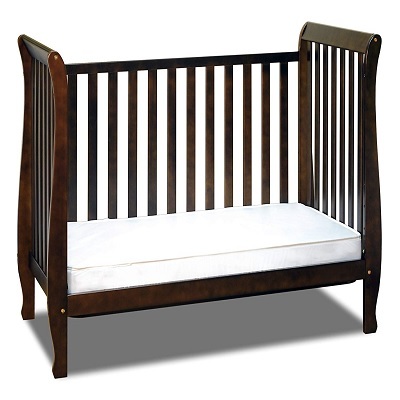 Once your child grows out of the crib, you can easily convert it to a daybed or toddler bed. 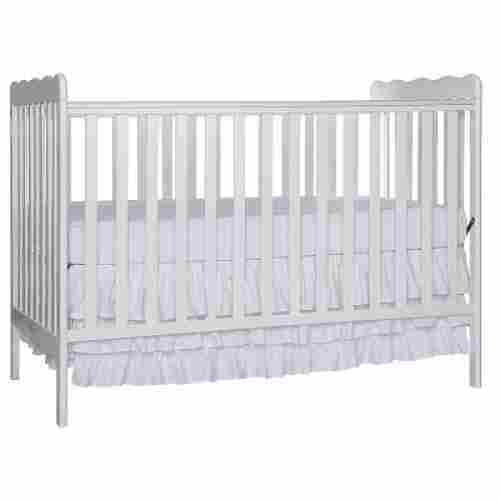 The Union 3-in-1 Convertible crib adds a bit of elegance to your nursery. 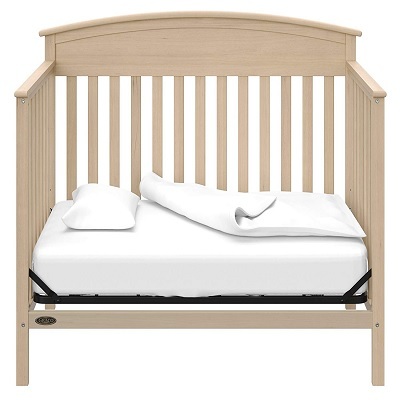 While the design is simple, the New Zealand pine wood makes this crib highly durable. 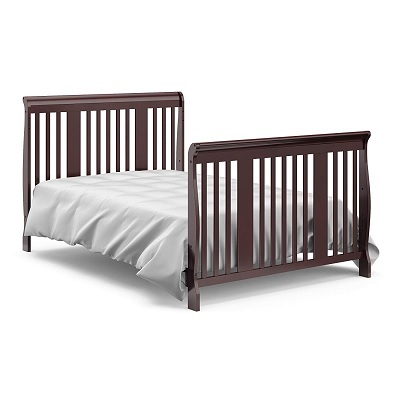 The finish on the crib is non-toxic and free of harsh chemicals. 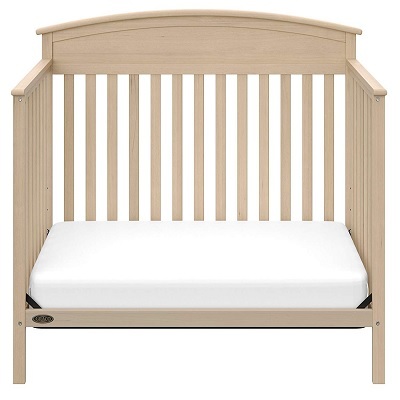 Composed of New Zealand pine wood with a nontoxic finish, this crib is sturdy, durable, and chemical free. 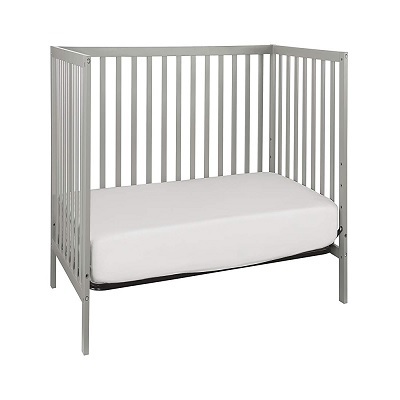 The crib weighs under fifty pounds so you can easily push it from room to room if need be. Assembly is easy and stress-free. 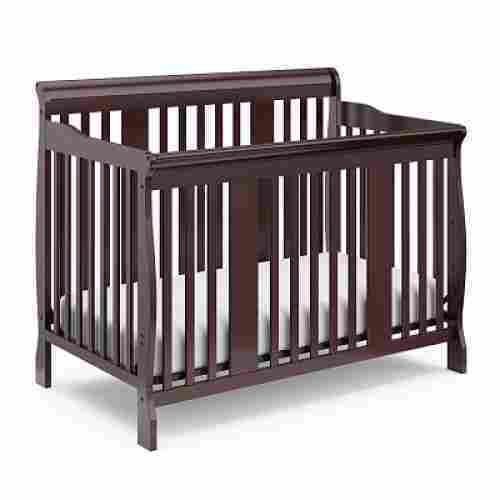 You can put your worries to rest knowing that this crib meets the ASTM International and US CPSC safety standards. You will feel much more confident placing your young baby in the Graco Benton for his or her much-needed rest than on any other baby crib in the market. 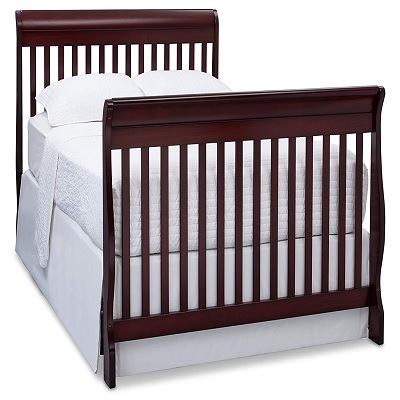 This 5 in 1 convertible crib will grow along with your baby. 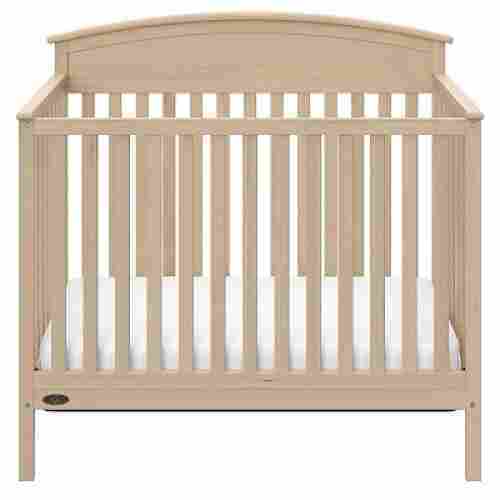 Convertible cribs a wonderful investment for parents because they will convert from a crib to a toddler bed, day bed and even a full bed. Whenever your child is ready for the next phase, your crib will be ready to go along with them. We love this product because it transitions along with your baby. Parents won’t have to worry about finding the next bed size for their baby as this will grow along with them. It's made from quality materials backed by Graco's outstanding reputation. 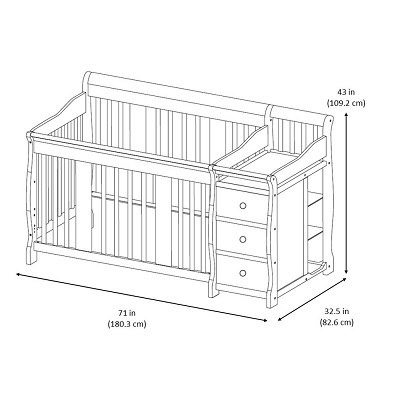 This crib will be able to hold any sized crib mattress sturdy and safely. You’ll even be able to adjust the height levels to suit your baby as well. We also love that it comes with adjustable height settings so that whenever your baby learns to stand on their own, you’ll be able to adjust it accordingly without having worry that they’re going to climb out. The attached changing table is easily this crib’s most notable feature. The built-in drawers and shelves will keep all of your diaper changing supplies organized and close by. The Stork Craft Portofino Crib makes midnight diaper changes a breeze. The crib is designed with an attached changing table. The three drawers and three selves on the changing table make it easy for you to store all of your baby’s needs. The changing table comes with a one-inch vinyl pad. The vinyl material is easy to clean and provides comfort to your baby’s back while they are getting their diaper changed. Once your baby no longer needs the changing table, you can easily detach it and use it as a nightstand. Composed of pine wood, this crib is stable and will remain stationary as your baby moves around. You won’t have to worry about the crib tipping over with your little one inside. 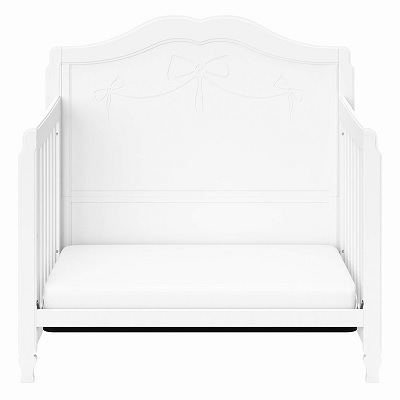 The gorgeous sleigh design of the crib and changing table will add a high-end look to your nursery. When purchasing you can choose between cherry, white, or espresso. The height of the mattress can be adjusted to three different settings as your baby grows. You will want to start with the mattress high and lower it as your baby begins to stand. Lowering the mattress will prevent your baby from accidentally falling out of their crib. 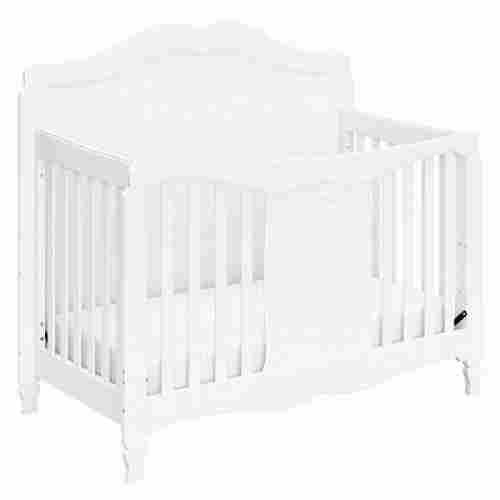 The crib converts into a toddler bed, daybed, and full bed, thus you will be able to use it for many years to come. 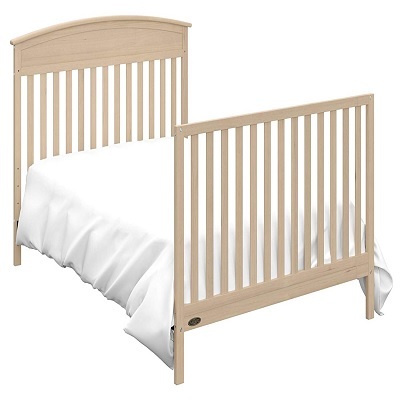 This crib has been safety tested and has been certified by the Juvenile Products Manufacturers Association so both you and your baby can get a good night’s sleep. 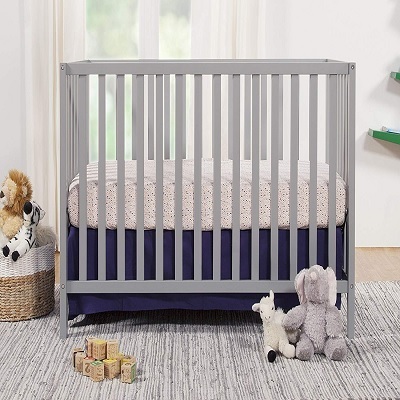 With a 4-level adjustable spring mattress support system, Athena’s Naomi 4-in-1 Crib with Toddler Rail provides absolute value for your baby’s comfort, safety, and security. The mattress height is adjustable, and this crib grows with your child as they reach the next step to toddler bed, to daybed, and eventually a full size bed. It can be easily converted into a day bed, a toddler’s bed, and a full-sized bed but with the proper attachments or conversion kits. It does, however, comes with the toddler rail conversion kit so you can expect your baby to use it even when he or she is already 3 years old. 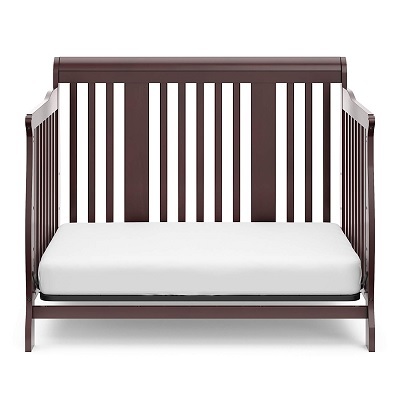 The Athena Naomi 4 in 1 Crib with Toddler Rail has a beautiful, modern design with a nice selection of non-toxic finishes to choose from. 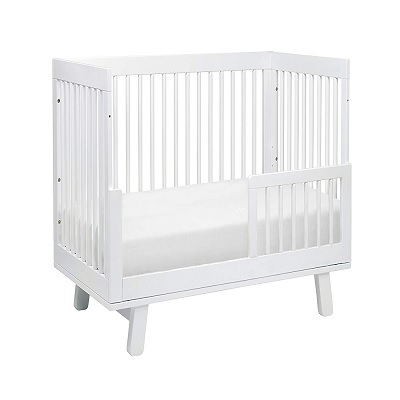 Made from solid pinewood for an extra sturdy frame to insure lasting durability, this crib is also equipped with stationary rails for additional safety. The 4 levels of mattress support allow convenience as your baby grows older to become a very active toddler and preschooler. The sides are made of environmentally sustainable, solid, and high quality pine wood and are designed not to be collapsed. The Naomi is also duly certified by the JPMA and has exceeded the federal product safety requirements of the US Consumer Product Safety Commission and the ASTM. The Naomi comes in 3 variants: Espresso, White, and Cherry. It’s great to know that you don’t have to buy another bed when your baby grows to become a toddler, a preschooler, or even a school age child. And who knows, maybe he or she can still use it even when he or she is already a teenager? You will have to buy the conversion kit, though. 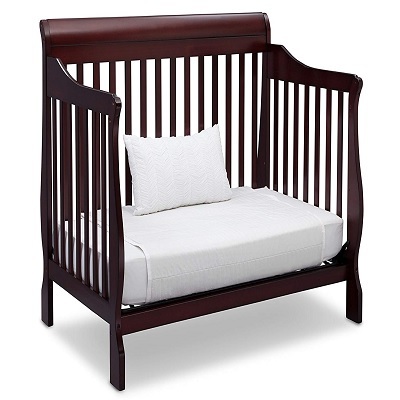 Nevertheless, it’s one great baby crib to add to your baby’s nursery before moving it to his or her very own bedroom. With its elegant finish and really beautiful curves, the Canton 4-in-1 Convertible Crib is something that will surely add to the overall aesthetic appeal of your home. The Espresso Cherry model of the Canton is something really elegant although the Dark Chocolate would be a nice alternative. For really simple tastes, you can get the Black or the Dark Cherry. 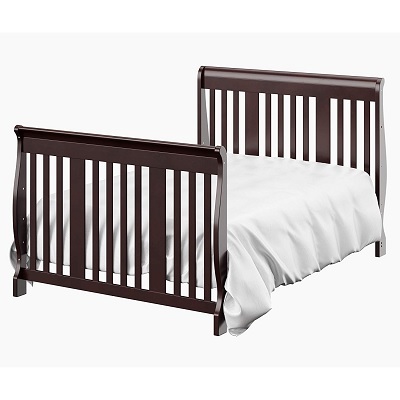 The Delta Children Canton 4 in 1 Convertible Crib has a gorgeous, sleek , modern sleigh design sure to make any nursery look absolutely beautiful. 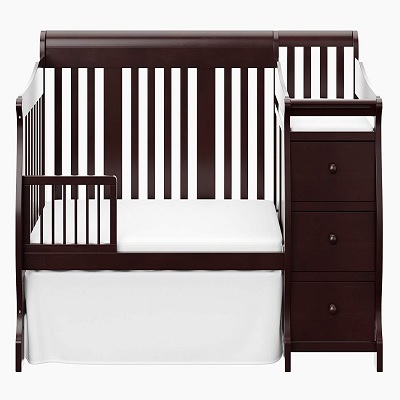 This crib turns into a toddler bed, to a daybed, and a full size bed when your child is ready. The Canton crib has a 3-level adjustable mattress support to allow for convenient placement of your baby in his or her crib. It also converts from a crib to a full-sized bed with a bed for toddlers and naptime purposes in between. The stationary rails insure extra safety and support for you little one as well as 3 adjustable heights for the mattress you can lower as your baby gets older. It is JPMA certified and is met with all of the CPSC and ASTM safety standards. It is easy to assemble and has been tested for lead and other toxins that could be harmful. With all the tools included, assembly is easy and stress-free. Converting the bed is just as easy, so you can spend more time with your little one and less time setting up. The Canton comes with a very sturdy and high quality solid wood construction and finished with child safe materials that do not contain any toxic chemicals like phthalates. It also comes with full certification from the JPMA and as such has the seal of approval from the strict requirements of ASTM and CPSC. There’s no need to count sheep with the Dream On Me 5-in-1 Convertible Crib as it will provide a peaceful night’s sleep for your baby. 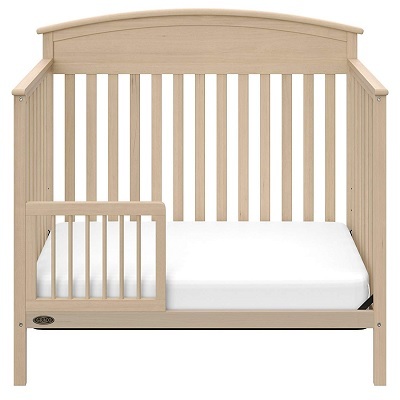 This crib allows you to save money down the road because your child can use this as they grow. It easily converts into a toddler bed, a daybed, or even a full bed. The support frame for the mattress is designed with four different height settings, thus you can adjust it as your baby grows. As your baby gets older you will want to drop the mattress lower, eliminate the possibility of your baby climbing or falling out. When purchasing, you can choose between nine different colors to match the decor of your little one’s nursery. All of the tools needed to assemble the crib are included which makes set up easy. When converting the bed, you have the option to use the footboard or store it away. The design and construction of the crib make it stable and durable. It is free of lead, BPA, latex, and phthalates so your child is completely safe. The four height adjustment system of the mattress and the crib’s convertibility allows your baby to use this for years to come. When Stork Craft designed the Princess 4-in-1 Fixed Side Convertible Crib, they only had one thing in mind – create the most stunning, artistic, and truly lovely piece of baby furniture for little ones. And while the name of the product suggests the Princess is definitely for baby girls, the white color of the Princess nonetheless provide a more neutral hue which means even baby boys can use it; you will have to change the bed linens, though. The Princess converts into a daytime or naptime bed, a toddler’s bed, and a full-sized bed, but only upon purchase of the conversion kit for full grownup beds. 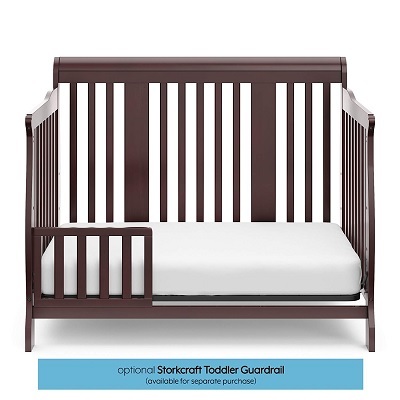 The Stork Craft crib comes with fully adjustable mattress support for up to 3 levels. 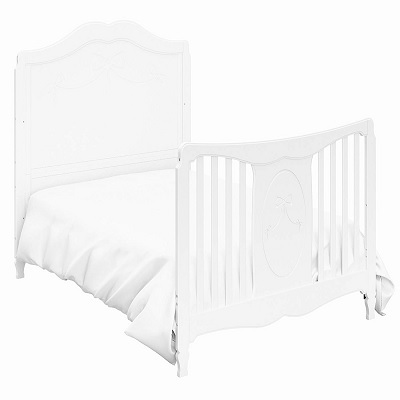 The Princess is one elegant-looking and truly classic baby crib. We love the fact that it can be converted into larger-sized beds so this means you can be sure you won’t have to buy another bed anytime soon for your child. Regrettably, like most convertible cribs in our list, you will have to buy the appropriate conversion kit. 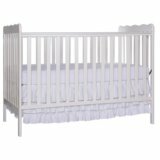 The StorkCraft Princess 4 in 1 fixed side convertible crib is an absolutely beautiful antique design made of wood and wood composites. While not particularly gender neutral, it does come in white as well as pink if you want to get it for a boy. This product is JPMA certified and meets all of CPSC, and ASTM safety standards. The finish is non-toxic for your little one’s safety. The rails are stationary and sturdy for added safety. The crib has 3 different mattress height adjustments and is convertible so it can grow with your child from crib, to toddler, to daybed, and full size bed. One of the most trusted names in baby cribs is Stork Craft. Their Tuscany 4-in-1 Convertible Crib is almost similar to their Portofino model except that the Tuscany does not come with the attached changing table and baby cabinet. Nevertheless, the Tuscany is essentially made of the same high-quality solid wood construction as well as non-collapsible sides for optimum baby safety. It is finished with child safe materials that do not contain phthalates and other harmful chemicals. It also converts into a toddler’s bed, a naptime bed, and a full-sized bed. 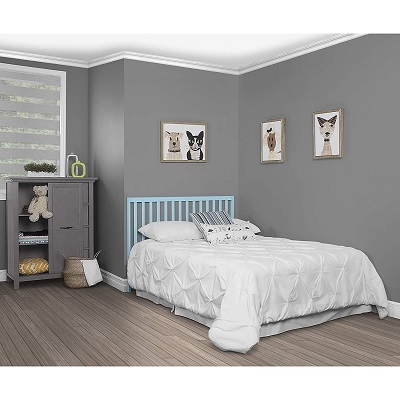 It already comes with a toddler bed rail but you will have to purchase a different rail if you are going to convert the bed into a piece of full-sized furniture. 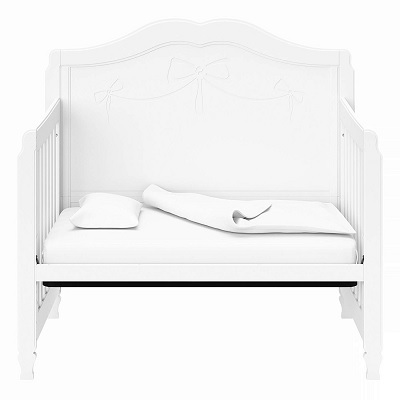 This crib is part of the Tuscany collection by Stork Craft and matches other furniture in the collection. It is easy to assemble and has a solid wood structure for durability. The rails do not fold down, thus eliminating the possibility of your little one smashing their fingers or injuring themselves if the rails accidentally fell. 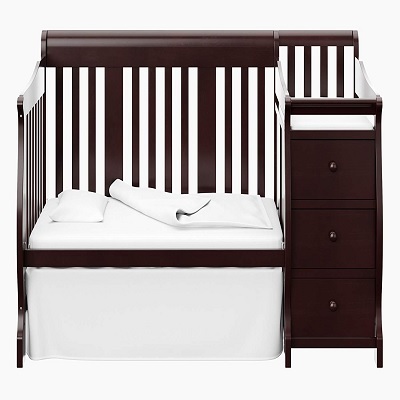 The StorkCraft Tuscany 4 in 1 Convertible Crib is a beautiful sleigh style crib with modern features and sleek edges. 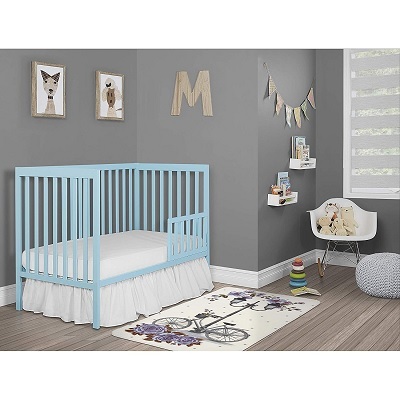 Its stationary guard rails offer extra safety protection for your child and this crib is JPMA certified with a non-toxic finish. The Tuscany also meets the strictest standards of the US CPSC and ASTM and comes with full certification from the Juvenile Products Manufacturers Association. It is within the walls or sides of the crib that infants below 18 months of age feel safe and secure. They know nothing can harm them as long as they are inside their crib. This can aid in the development of a healthier emotional well-being later in life. The different features or attachments to the crib can also help enhance their emotional skills by providing babies something to play with. Baby cribs are very important pieces of baby furniture. With our list of the 10 best-selling cribs, you can be sure it will be the last piece of baby furniture you will ever buy as many of these are designed and built for your growing kid. Even when they are already grownups, they can still use their precious crib. When purchasing a crib and a crib mattress we know it can be overwhelming and very time consuming for parents or expecting parents to be because there are so many that they can choose from. We did the research for you and looked at nothing but the highest rated products in the market of 2019. Our list is nothing but the best of the best and we did our extensive research looking at each manufacturer, customer satisfaction, reviews, and ratings. One important thing to remember is quality. We wanted to make sure that each crib was made of nothing but the highest quality materials in today’s market. We also made sure that the paint that some use is non-toxic so if your teething toddler happens to leave some bite marks on their crib parents won’t have to stress as much. We all know that babies are at the most vulnerable stage in their lives. Their physiological integrity is not yet that fully developed. As such, they are more susceptible to a lot of external influences that may undermine their optimum growth and development. 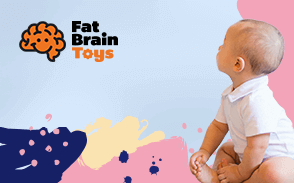 And while we all agree that they need developmentally appropriate toys for them to learn and optimize their brain and motor development, it is crucial to provide them with a more secure and safer environment to rest and play. The baby crib is more than just an oversized bed for babies. For them, it is their home. It serves as their own little world. They feel more secure in it than outside it until such time that they are already able to explore the world outside their crib. For them, the crib is a place where they get warm hugs from their parents and other caregivers. It is the place where they eventually get fed most of the time. It is also the place where they see moving, colorful, and lighted objects. It is in the crib where they had their first encounter of music and sights other than those produced by mom and dad. It is in the crib where they learn to pull themselves up to, first, a sitting position, and then eventually, a standing position by holding onto the rails of the crib. It is in their beautiful crib that they have mastered their gross-motor skills particularly their leg and arm muscles. Many studies show that it’s important for infants to sleep in their own space starting around 4 months. They found that babies tend to sleep for a longer period of time when they sleep in their own room. Often parents worry about the cost of a crib since their infant will only be in one until they’re about the age of two. This is why convertible cribs are always a wonderful investment as they’ll be there whenever you feel your child is old enough for that next step. We wanted to make sure that safety was also something we considered when coming up with our top ten list of best cribs in today’s market. We know that having a new edition to your family isn’t always easy and the last thing we wanted was another thing for a new parent to be stressed about. We did the research for you and made sure that you were getting safe, nontoxic, quality made products that you’d be able to get for long time use. 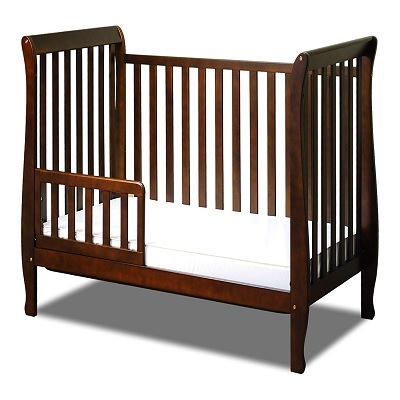 All of the cribs on our list convert and have the highest number of reviews from customers. We also looked at every positive and negative reviews regarding each product on our list and therefore we were able to create the best cribs of 2019.
q: Do the cribs come with the extension kits? No, but you can order them online through the manufacturer or other websites. q: Are all the cribs listed GREENGUARD Gold certified? No but all of the cribs are nontoxic and have been safety-certified. q: What material are most cribs made from? Most cribs are made from pinewood, cherrywood, and wood composites. q: Do any of the cribs come with a mattress? Very few cribs come with the mattress, and if they do, it is generally thin in nature. q: Is it important to check dimensions when purchasing a mattress for my crib? Yes. While most cribs will fit standard-size crib mattresses, not all will be the same dimension. Check and make sure your dimensions of the crib and mattress are the same before you make a final purchase. q: How long does it take to assemble most cribs? It takes anywhere from 20 to 60 minutes to assemble most cribs. q: How long before my baby outgrows their crib? Great question! It seems a little silly to make big investments in items you can’t use for very long, doesn’t it? The good news is that there really is no mandated time at which you must move your child from a crib to a toddler bed, but the median age is somewhere between 18 months and 3 years. You’ll start to notice when your child is big and agile enough to climb the railing (some cribs pinpoint this stage at happening when a child reaches about 35 inches tall). At this time, it’s best to move your precious little one to a toddler bed to avoid any accidents. The even better news is that many cribs on the market have already cornered and solved this problem for you by constructing convertible cribs that can be changed into toddler beds, and sometimes even daybeds, so you aren’t buying a piece of furniture you’ll have to replace within two years.